Secret Sneak Peak at Mediafly SyncPoints... You can now personalize the podcasts on your Chumby. As you change your shows and channels on Mediafly they are immediately changed on your Chumby. 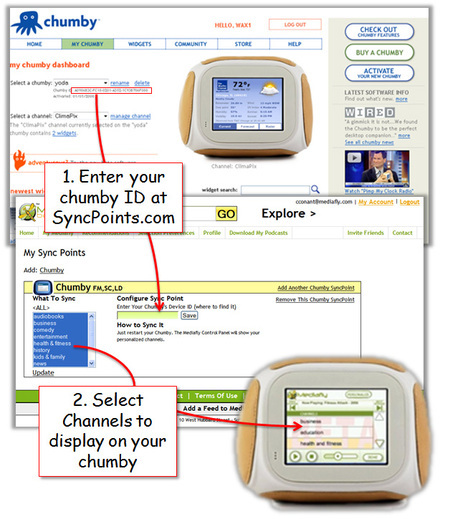 Here are the steps to personalize your Chumby (and a nice little visual below to show you). 1) Create a Mediafly account if you have not already and create your channels. You can always add/remove/modify them later. Your Chumby will adjust automatically. 2) Login to the Chumby website with your Chumby user id and password. 3) Find your Chumby ID. It is the long number that appears to the left of your Chumby (see below). Copy that full ID. 6) Paste your full Chumby ID into the box provided (shown below). Press Save. 7) Reboot your Chumby by pressing the little on/off button on the back. 8) Your Chumby is now synced with your Mediafly account. You should now see all of your Mediafly Channels in the Mediafly audio source on your Chumby. If you have any questions, you can email me at www.mediafly.com/contactus. Sweet Potato or Zucchini cakes for starters. Giving a smile away takes so little effort and time, let’s make sure that we’ve not the one that others have to pretend is wearing an invisible smile. Usability and User Experience certainly has a larger scope than that. Just as the saying goes that you are never too old to learn. I believe it. Name and email address are required. Giving a smile aside requires so tiny work and time, let’s ensure that .